The Christmas song, "It's the Most Wonderful Time of the Year" has a line about "There'll be scary ghost stories and tales of the glories of Christmases long, long ago." The article's title is "Telling Ghost Stories Is a Lost Tradition on Christmas Eve." WELL! As I write this, it's October, a month when scary ghost stories are especially popular. If you need a bit of advance preparation for Christmas and a Victorian Christmas, too, here are some resources for you. As you can faintly read, Marley's Ghost, from Charles Dickens' A Christmas Carol is my illustration. Certainly that ghost story pops readily into the minds of most people thinking of Christmas Ghost Stories. 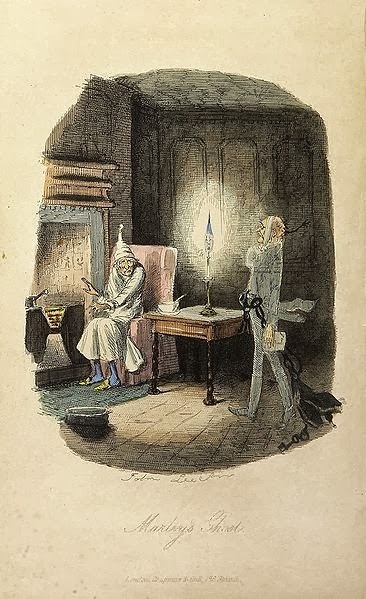 Did you know Dickens did an earlier version in his The Pickwick Papers when a character tells of the conversion of a Scrooge-like sexton after goblins show him the past and future? While the book had troubles initially, A Christmas Carol finally was a success. Since Dickens liked its moral message, he wrote annual versions of the story in 1844, 1845, 1846, and 1848, The Chimes, The Cricket on the Hearth, The Battle of Life (the only one with neither religious nor supernatural element), and The Haunted Man and the Ghost's Bargain. Later Dickens wrote a short story, The Signal-Man, as part of the Mugby Junction collection in the 1866 Christmas edition of All the Year Round which also might qualify. Dickens may have popularised the Christmas ghost story, but the tradition precedes the Victorian era. Washington Irving's book, The Sketch Book of Geoffrey Crayon, Gent. published in 1819, describes a traditional English Christmas with the Squire's guests listening to the parson tell of "strange accounts of popular superstitions and legends of the surrounding country" and some even point to Elizabethan England and Shakespeare's "A Winter's Tale" containing the line "A sad tale's best for winter: I have one of sprites and goblins..." as Prince Mamillius offers to tell a story. Similarly his predecessor, Christopher Marlowe's play, The Jew of Malta, has a character say, "Now I remember those old women's words, who in my wealth would tell me winter's tales, and speak of spirits and ghosts that glide by night..."
A Christmas legend involves that famous ghost of the Tower of London turned Anniversary ghost, Anne Boleyn. At Christmas she appears at her childhood home of Hever Castle. Anniversary ghosts are a type of ghost returning on days important to the ghost. Why is Christmas important for her there? It must go back to her childhood before she married Henry VIII. Here are three Victorian ghost stories available online. "Susie's Story" in Winnie and Walter's Christmas Stories by Increase Niles Tarbox from 1860. From "Ainsworth's Magazine", volume XI, published in 1847 is "Tom Punder - A Ghost Story for Christmas" by Dudley Costello. The Water Ghost of Harrowby Hall by John Kendrick Bangs, written in 1894. On the My Merry Christmas network I posted this spooky ballad from 1830, The Mistletoe Bough, based on various traditional legends. If these stories chill you, you may find it interesting to know when Dickens was a child, Britain had a "mini Ice Age" so his stories carry that setting. This Is Horror attempts to look at the psychology behind Christmas Stories. It also looks at M.R.James, who was a child in Victorian England. His many ghost stories didn't start to be published until 1904, but this academic born in 1862 carried the genre into the 20th century. Publishing just a few years before the end of the Victorian era in 1898 is that other James, Henry James, whose well-known The Turn of the Screw opens with people sitting around telling ghost stories on Christmas Eve. That's as close as the story comes to being a Christmas story, but it does make a brief nod to the tradition. Since it's a novel, it really goes beyond the scope of this article, butI just couldn't resist the link to let you read it. Another look below the surface at what happened in Victorian Christmas ghost stories is in a 2012 dissertation by Brandon Chitwood at Marquette University. A Victorian Christmas in Hell: Yuletide Ghosts and Necessary Pleasures in the Age of Capital looks at how capitalism and literary development influenced the genre. 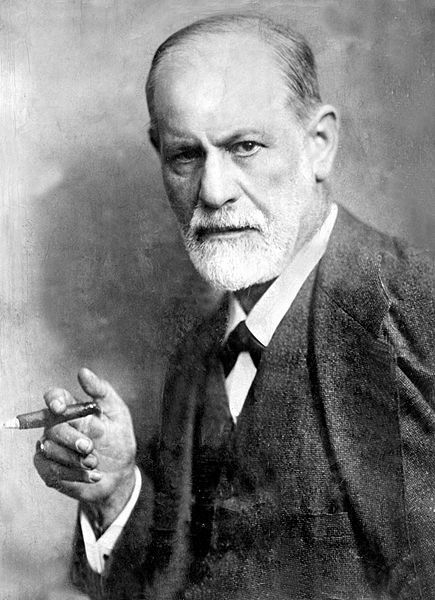 The dissertation particularly gets Freudian discussing women authors of the genre precisely because of Victorian roles for women. Chitwood names Elizabeth Gaskell, Mary Braddon, Rhoda Broughton, Margaret Oliphant, and Ellen Wood as best-selling authors of "popular, and often subversive, domestic novels." Unfortunately they wrote these short stories for magazines, like Charles Dickens' "Household Words." Elizabeth Gaskell's "The Old Nurse's Story" appeared in the Christmas edition of the weekly journal by Dickens, that edition was called A Round of Stories by the Christmas Fire. It's interesting Dickens doesn't list any of the authors, leaving the impression of writing it himself! Chitwood describes the invisibility of Victorian women as being ghostlike. Margaret Oliphant's novella, The Open Door, is re-printed in the 1918 book, Great Ghost Stories, but she died in 1897, so it originally appeared earlier. While some of the novels by these authors are available, tracing their shorter works online is difficult...especially when they are anonymous. Victorian Christmas and its ghost stories are all public domain, so it leads well back into this blog's series, "Keeping the Public in Public Domain" which return next week. In the meantime, happy scary reading!